A new edition will come out in 2019 (I hope). Special emphasis on healing properties of thermal waters. Stay tuned. The health benefits of Mexico's hot springs and hot pools are well-documented. My own experiences with the healthy benefits of the hot springs of Mexico are that soaking in some hot springs alleviated and put into remission the arthritis in my knees when I was forty years old. I have now left sixty-five in my rear view mirror. My knees are fine, but the arthritis in my back is still there. My psoriasis goes into remission after one day at certain hot springs in Mexico. 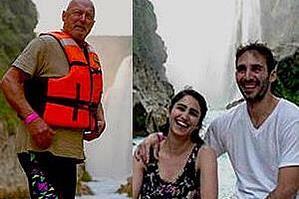 I know people whose general health and well-being benefit with a stay at many hot springs of Mexico. An insomniac who had not slept a full night in ten years slept soundly each night she stayed at one Mexican hot spring - year after year. My book is out-of-print. Sulfur hot springs are especially efficacious in treating psoriasis. Arthritis seems to be helped greatly by the higher radioactivity. There are unscientific assertions, based on my own personal experience. I have read the same anecdotal evidence in many different books, however. Mexican hot springs have been estimated to be 576. Some say there are more than 1,000 Mexican hot springs. I believe there are too many hot springs to count in Mexico. There is also a glut of spas in Mexico. Do not confuse spa with hot springs. They are two very different animals. I got out of the spa business and don't review them anymore. Spa people are usually not hot springs people. Mexican spas do not usually have hot springs. The only one I like is Rancho La Pitaya, in Apaseo El Grande, Guanajuato, 15 minutes from the city of Querétaro. The others are too full of themselves. Most of Mexico's hot springs are in the states of Aguascalientes, Michoacán, San Luis Potosí and Guanajuato. One of my favorite Mexican hot spring is in San Luis Potosí state. There are Mexican hot springs in Durango, Veracruz. Zacatecas, Jalisco, Chihuahua, Sonora, Hidalgo, Puebla, Nayarit and other Mexican states. 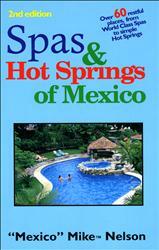 My book, Spas & Hot Springs of Mexico (now out of print and available as a used book only) reviews 60 spas and hot springs. I will update the book someday. But not today. 40 chapters of Spas & Hot Springs of Mexico are on Mexico's hot springs, with mineral content, water temperature and driving directions for the out-of-the-way hot springs. A lot of work went into it and it is the only Mexico-specific hot springs book. For sample chapters see samples. The spas of Mexico or Mexican spas are different than Mexican hot springs. Like in the United States, a spa doesn't need to have a hot spring. The Hotel Ixtapan Spa no longer has a hot springs-fed pool. The city of Ixtapan de la Sal does still have a very nice balneario and it is open late at night now and has been completely remodeled. Many Mexican hot springs are commercial enterprises, called balnearios. You have to be specific when asking locals about hot springs. To Mexicans, a balneario doesn't have to have hot water. It is a generic term for a bathing place. To find a hot spring, ask for un lugar con aguas termales (thermal waters). You might still get a wrong answer, but you have a better than 50-50 chance of finding a hot spring for a soak. Also, upper-class Mexicans do not frequent Mexican hot springs. So if you ask one of them about a balneario, they are more likely to refer you to a spa. As time goes by, I will put a few Mexican hot springs on this site. 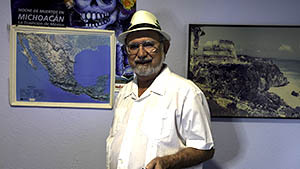 Visit my friends at US hot springs on your way to Mexico.